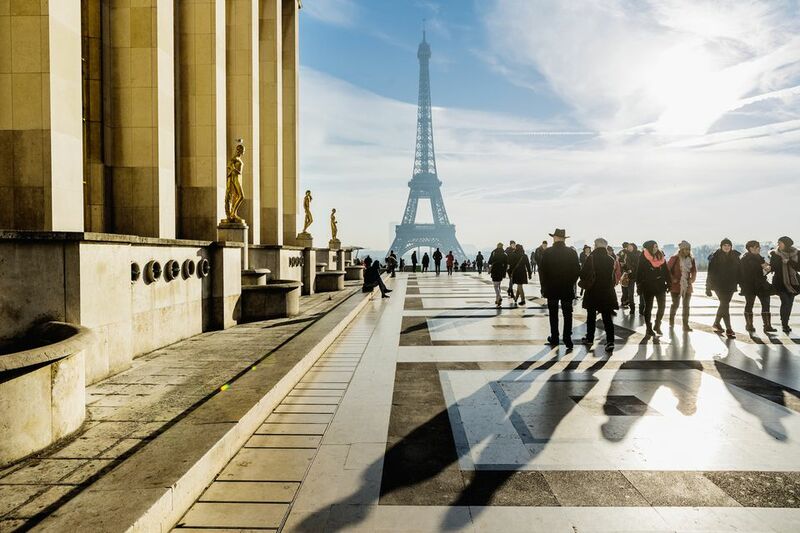 ​Many tourists stumble on the grand complex known as the Palais de Chaillot without realizing what it is or what it has to offer—aside from its breathtaking views over the Eiffel Tower and the Trocadéro, of course. Built in 1937 for the Universal Exposition that same year in Paris, the "palace" is home to the National Chaillot Theatre as well as several museums you may be interested in exploring. The Cité de l'Architecture et du Patrimoine (Architecture and Cultural Heritage Center), the Musée de l'Homme (Museum of Man), and the Musée National de la Marine (Naval Museum) are all located within the walls of the sprawling neoclassical complex. For visitors with interests in ethnology, military history and/or architecture and culture, the Palais de Chaillot offers plenty of interesting things to do for a morning or afternoon, perhaps before or after visiting the famous tower that looms nearby. This grandiose site, perpetually crowded with tourists and vendors selling a variety of knick-knacks and snacks, has a complicated and somewhat sinister history. After the Nazi army, led by Adolf Hitler, invaded Paris in 1940, staging a triumphant parade on the Champs-Elysées and beneath the Arc de Triomphe, Hitler stopped at the Palais de Chaillot. He posed for a photo on its large terrace along with two of his officers. Later, in 1948, this was the site of a special meeting of the United Nations General Assembly. Following the end of World War II in 1945, in which millions of Europeans had perished on battlefields and in death camps, the United Nations General Assembly gathered at the same site to sign the Universal Declaration of Human Rights. This was an apt place to do it, too, with the "Musee de l'Homme" anthropology museum onsite. Depending on how much time you've got and your personal interests, decide which collections at the Palais you'd like to explore during your visit. Unfortunately, there is not a joint ticket for entry to all three museums. Whether you opt to visit one or all of these, do make sure you take time to head out onto the large, open terrace and enjoy the views from there. If you're interested in the history of French architecture and monuments, this museum is potentially worth a visit. Spanning the medieval period to the present day, the museum's permanent collection offers visitors an in-depth look at architectural and city design history. From the Roman period through to the Gothic, Renaissance and early modern period, you'll be taken through the dazzling evolution of French and European architecture, with close attention paid to elements such as sculpture, stained glass, wall and ceiling paintings, and more. The newer modern galleries, inaugurated in 2007, tell the story of around 100 of France's most-celebrated modern buildings and monuments, highlighting architects such as Gustave Eiffel and Jean Nouvel. Meanwhile, temporary exhabits at the "Cité" focus on particular schools of architecture, renowned architects or changes to urban landscapes over time. The Cite de l'architecture et du Patrimoine is open Monday and Wednesday to Sunday, 11 a.m. to 7 p.m.; late opening until 9 p.m. on Thursdays. This old-world anthropology, biology, and cultural history museum explores the evolution of humans and their complex societies. Located in the Passy wing at the Chaillot, the museum was opened in 1938, a year after the Palais Chaillot was inaugurated. Following several years of renovations designed to modernize and update the collections (in part due to its controversial past), the museum reopened in 2015. Claiming to take a different approach from other museums of anthropology, the Musee de l'Homme brings research from biological sciences and cultural history to the table as well. The permanent exhibit features an impressive array of artifacts related to the history and evolution of humans and human societies, the permanent collection focuses on three major themes: who we are, where we come from, and where we are headed. Visitors move through chronologically arranged sections of the exhibit to discover Cro-Magnon humans and their daily lives, rituals and artifacts from Paleolithic and Neanderthal societies, elaborate and disconcerting medical devices from the medieval period to the modern, eerie wax anatomical models, and much more. The collection is fascinating, and holds some of Europe's most precious objects from the prehistorical period. The Musée de l'Homme is open every day except Tuesday, from 10 a.m. to 6 p.m. It closes on January 1, May 1 and on Christmas Day. Dedicated to the history of the French naval forces, this museum is currently closed for major renovations through 2021. Its permanent collections include models of naval battleships and steamers, full examples of smaller seacraft and canoes, paintings depicting naval scenes, objects of daily life used by Marines, and other historical artifacts. One of the best places in Paris to see live dance performances from companies around the globe, the Theatre National de Chaillot stages several shows a year. See the official website for the full schedule and to purchase tickets online. The Palais Chaillot is located in the western 16th arrondissement district of Paris, in close reach of attractions and areas including the Champ de Mars, the Jardins du Trocadéro (a large public garden ideal for families), and several modern art museums worth spending some time visiting. See here for current information and admission prices for the museums and the Theatre de Chaillot. Visitors under 26 with valid EU passports enjoy free entry; in addition, the museums offer free admission on the first Sunday of every month. The Paris Museum Pass covers admission to the Cite de l'Architecture et du Patrimoine. If you have the pass, be sure to use it for free entry to this collection! The Chaillot complex includes a gift shop where you can purchase postcards and souvenirs, a bookshop, and two restaurants for a casual bite or snack: Café de l'Homme and Café Lucy, both located inside the Musée de l'Homme. If you're looking for a more formal lunch or dinner, there's an onsite restaurant and cafe attached to the Theatre National de Chaillot, La Maison Pradier, that serves typical French cuisine. It's an ideal spot for a romantic dinner following a show at the theater, and with views over the Eiffel Tower and the Champs de Mars, the location is rather unbeatable. On performance evenings, later dinner is served from 6 p.m. to 11 p.m. There's also Sunday brunch from 11 a.m. to 4 p.m. To reserve a table, call +33 (0)1 53 65 30 70 or send an email to chaillotpradier@pradierparis.com. As mentioned above, there are several noteworthy museums and places to visit in the Trocadéro area. For modern art fans, a visit to the nearby Modern Art Museum of the City of Paris and adjoining Palais du Tokyo is something we highly recommend. If you're interested in the history of fashion and style, make sure to beeline over to the Palais Galliera, only a five-minute walk from the Chaillot complex. Its temporary exhibits on design and style history, retrospectives on great "haute couture" designers and tributes to fashion icons are superb. Finally, see our guide to the 7 most interesting things to see and do around the Eiffel Tower for more ideas on how to make the most of your time in the area. While the general area around the Palais de Chaillot is quite safe, be aware that pickpockets operate frequently in the vicinity, taking advantage of the large crowds. Read our full guide to avoiding pickpockets in the French capital, and keep your belongings safe and out of reach of thieves.